Choose from our standard vinyl colors that resist fading, pitting and peeling. Color is consistent throughout our solid linen white or almond making it easier to match your house decor. Our two-tone colors feature clay or sahara brown on the outside of the window and linen white on the inside while our oak is featured on the inside of the home. Decorative grids provide the look of divided lite windows in either one or both sashes. Grids are sealed between the two panes of glass so that cleaning is made easy. From a traditional to a contemporary look, choose from three grid patterns. Note: Flat grids are not available in two. Foam filled frames can reduce energy costs over the life of the windows. The same foam applied in many refrigerator and freezer doors, this polyurethane foam also enhances condensation resistance. Dress up any home's window or door and create a custom look to call your own by choosing obscure glass. 3M's Accentrimâ glass or an artistic appearance with resin art. Your home is your safe haven, and you want it to stay perfect in the way it looks and functions. But severe weather conditions can put many families and their homes at risk each year. The danger is real. So it's understandable that protecting a home is your priority. And in some areas, protecting a home is required by building code. Many coastal communities along the eastern seaboard have adapted these codes. The DP-50 requirement is based upon potential horizontal rain and high wind conditions. 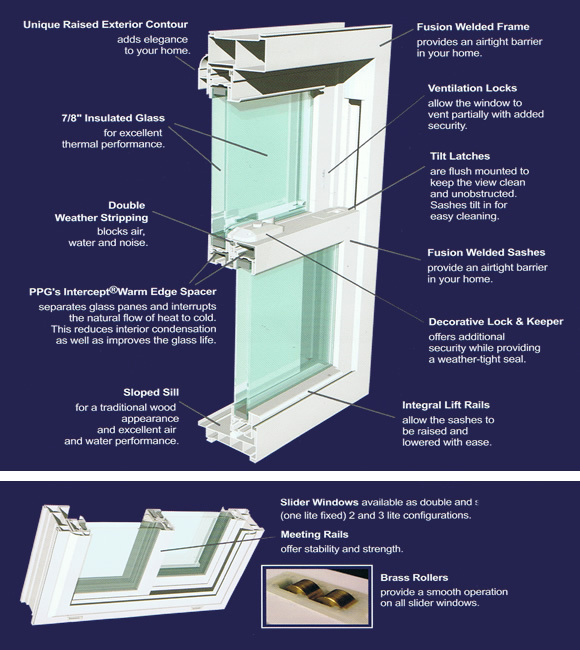 With our DP-50 upgrade, Perfect Fit windows meet these strict codes and insulate your home and family with the best protection. All Perfect Fit products feature 7/8â€? insulated glass. A metallic, Titanium soft-coat LowE coating can be added to the glass surface to reflect heat according to climate. With the option of LowE, radiant heat is reflected back into the home during the winter months reducing heating costs, while unwanted solar heat gain is reflected away from the home during the summer months, reducing cooling costs. LowE Glass reduces solar heat gain during the summer, but draws the warmth in the home during the winter. Optional Argon Gas, which is about 40% more dense than air, can be added to replace the air within the sealed insulated glass airspace. The inert gas slows down the movement of the air within the airspace further reducing the transfer of heat to cold for more improved energy efficiency. To take advantage of all the benefits and features of our window replacement services, please complete our quick online form or you may contact us directly at 240-205-6188. You can expect quick and professional response from our customer service representatives. Receive a Free Glass Storm Door Installed, with a qualifying replacement window package for your home from Congressional. Rest assured that information provided will not be disclosed to other parties and will be solely used to fulfill your request for a remodeling quote. Only Congressional Construction delivers customized windows remodeling services to meet your needs, giving you benefits that go beyond appearance. 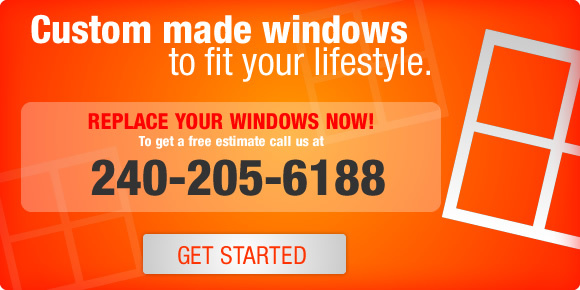 We work with you to find just the right windows to meet your remodeling needs. We ensure your new windows are installed properly the first time to provide years of enjoyment, functionality and dependability. Our company believes in creating lasting relationship with customers and we do this by providing quality products, competitive rates and exceptional customer service. Improving your home with new windows and doors. New windows can do more than just enhance the look of your home. They infuse your home with natural light, beautifying for the world to see. And they can also keep you comfortable in any kind of weather, saving you thousands of dollars on energy bills. But, when choosing new windows and doors, you're not just concerned about look. You want innovations that help make life better. Like grids that are sealed between the glass, sturdy decorative hardware, ventilation locks for additional security and easy-clean features on double-hung, slider and even casement windows. Since 1924, Vytex has been creating windows and doors that are built with quality craftsmanship and commitment. Each Perfect Fit window starts with virgin vinyl. The sashes and the master frame are welded together creating a solid individual one-piece unit that will separate or weaken. Ever. Unlike other windows made from wood, vinyl will not absorb water, swell or rot. They will never peel, pit or corrode so you'll never have to paint your windows. And with a little soap and water, your new windows will continue to look brand new for many years to come. Perfect Fit is available in a wide variety of styles including double hungs, sliders, picture windows, casement and bays and bows. Choose from our selection of innovative options to our decorative glass that are not only beautiful but functional as well. This new law increases the homeowner tax credit from 10% to 30% of the cost for qualifying energy efficient upgrades - with a maximum of $1,500 per houshold.